Special Thanks to Erin Morey for the meme. I find that Eleanor Roosevelt had several quotes that resonated with me. This is the second one from our former First Lady. The first can be found here. This is a picture at the Grand Canyon, where the Hualapai Indian Tribe built a skywalk out over the expanse of the canyon. The floor of the walk is clear glass, meaning that you feel like you are walking out over open air. While my wife and I enjoyed the experience (we even jumped up and down on the glass), many of the people around us were unable to step onto the glass, or if they did, would not let go of the solid steel handrail around the perimeter. As so many great leadership / self-help experts will tell you, greatness typically lies right outside your comfort zone. If you are constantly comfortable, then you will not grow. As a leader, it is your job to make sure the team grows, and sometimes that means being the good example. What are you doing to grow? 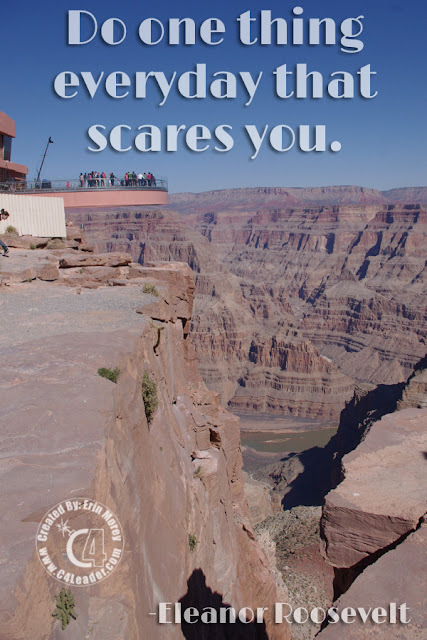 What should you be doing that scares you? As an example, I am working toward a live event based on my C4 Leadership System (C4LS), with the intention of finding a way to make it mobile to other cities. I am excited for the opportunity, and honestly it is way outside my comfort zone to build an event and advertise it, rather than to be invited to one. I will let you know how it turns out!